Lowes and Haslam behind four-time champion on the timesheets. Jonathan Rea (Kawasaki Racing Team) has topped the times for the second consecutive day of Motul FIM Superbike World Championship (WorldSBK) testing in Jerez, Spain, where four teams continued to work on their 2019 set-ups. 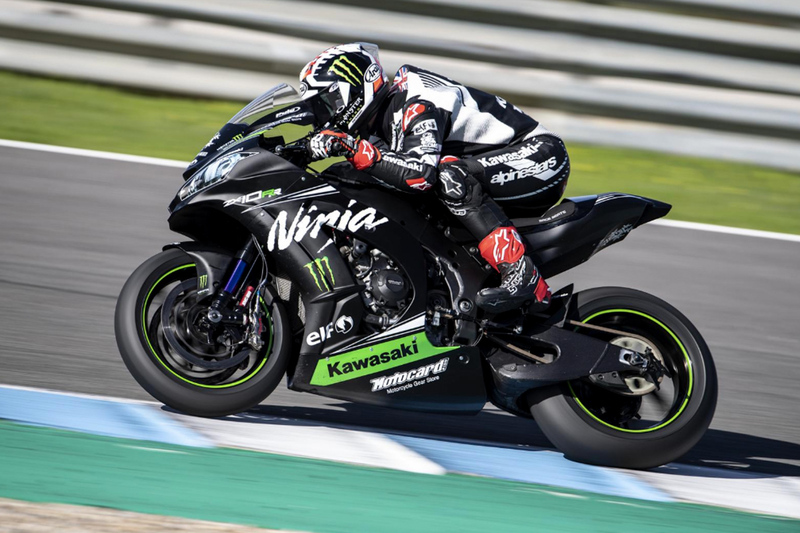 Rea continued with his sensational pace out on track for the second and final day of testing, as the 2018 world champion was continuing to work on getting the chassis in tune with the engine on his ZX-10RR. Explaining that his new bike offers even more potential than the 2018 Ninja, he was a force to be reckoned with, setting the fastest lap time of 1m38.713s. On the other side of the garage, new team-mate Leon Haslam (Kawasaki Racing Team – WorldSBK) was left with one bike after a big crash on Monday. However this didn’t stop the Brit putting the laps in, as he reached over 100 on the second day. Ending the day in third with a time of 1m39.766s, Haslam was able to continue with his base setting of the ZX-10RR and will take some strong pace into the winter. It was a telling two days for the Pata Yamaha Official WorldSBK Team, as they began to understand the work they will need to do to bridge the gap to the green and red machines out on track. Working through their small updates for 2019, Alex Lowes had a strong test sitting in second position for most of the day, bridging the gap to fastest man Rea. Whilst for team-mate Michael van der Mark, it was a tough test as he was riding injured from his crash in Qatar, which resulted in a fracture to his wrist. Working to get more grip and acceleration on exit amongst other factors, Lowes finished in second position overall, 0.664s off Rea’s pace whilst van der Mark was sixth and 1.379s behind. Lessons continued to be learnt for the Aruba.it Racing – Ducati squad with Chaz Davies and Alvaro Bautista getting to grips with the all new Panigale V4 R. British rider Davies is continuing to struggle with his shoulder injury sustained over the summer break, meaning he isn’t riding at 100 percent. Moving his focus over to electronics and throttle connection on his new machine, it was a busy day for Davies who finished in fifth overall. Whilst for Bautista, he had a more challenging second day with his V4 R, suffering two crashes during the day around Circuito de Jerez Angel Nieto. Able to walk away from both crashes, Bautista was still happy with the bike as he works on his base set up and understanding the WorldSBK machine. Putting in an impressive pace on his debut, Bautista was able to finish in fourth, with a lap time of 1m39.845s. For new WorldSBK team GRT Yamaha, Sandro Cortese and Marco Melandri were continuing to get to grips with the YZF-R1. Happy with the progress they have made, 2018 WorldSSP champion Cortese was still working on adapting and adjusting to premier class machine, whilst Melandri was working on his base setting and with the Pirelli tyres.